In 1905 the union between the Norwegian and Swedish kroner was coming to an end, and Norway had only a modest fleet of coastguard and torpedo boats. The weakness of the industrial means of the country forced the government to order its largest units in England, contrary to the Swedes. This fleet was limited to a monitor and 4 coastal battleships, 4 gunboats, a destroyer and 12 torpedo boats. The total strength was 1000 active men reinforced per 1000 conscripts. It was planned to build additional units before 1914: 3 destroyers, 3 torpedo boats, 4 submersibles, and two other coastal battleships were planned. 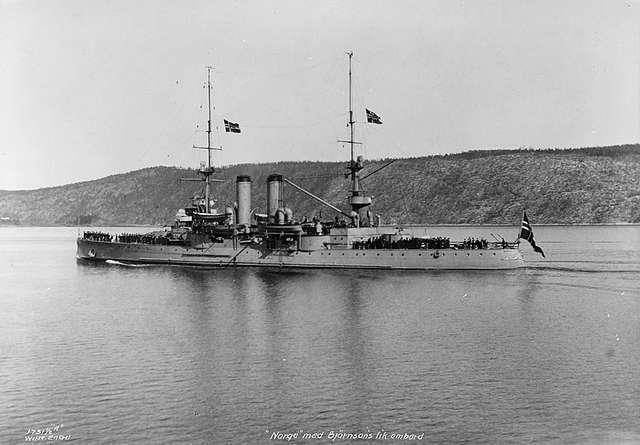 4 Coastal Battleships: 2 class Norge (1900), 2 class Haarfarge (1897). Expected (ordered in 1913: 2 class Nidaros, they were requisitioned by the RN in August 1914 and integrated as HMS Gorgon and Glatton). 2 Cruisers: Frithjof (1895), Viking (1891). These two low-tonnage ships were rebuilt and rearmed in 1904-08. 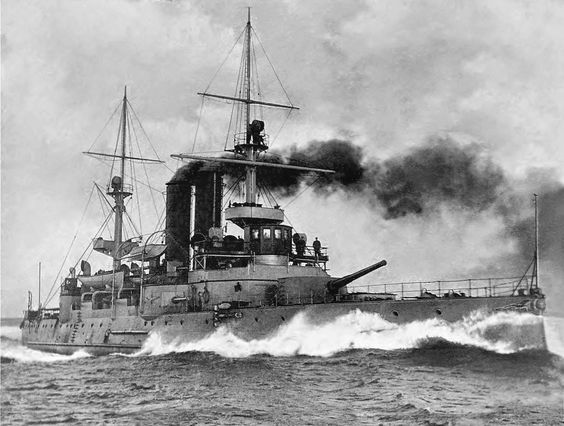 Frithjof served as a training ship. 4 Destroyers: Recent: 3 class Draug (1908-13), Valkyrjen (1896). First class: 3 class Teist (1906), 10 class Hval (1896-1901). Second class: 5 class Ravn (1903), 4 class Hvas (1900), 8 class Varg (1894), 3 class Snar (1888), 4 class Of (1882). Third class: Rap (1872), Ulven (1878), Myg (1899). 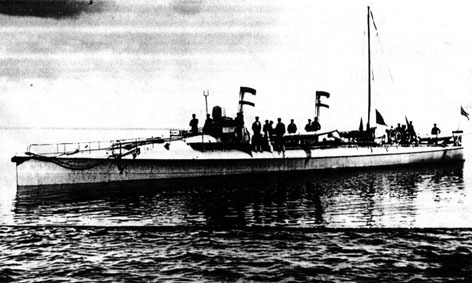 4 Submersibles: Köbben (1909), 3 class A2 (1913). Built in Germany. 11 Miscellaneous: Gunboats Aeger (1893), Ellida (1880), 2 Gor class (1884), 5 Vale class (1874), 2 class Rjukan (1860). 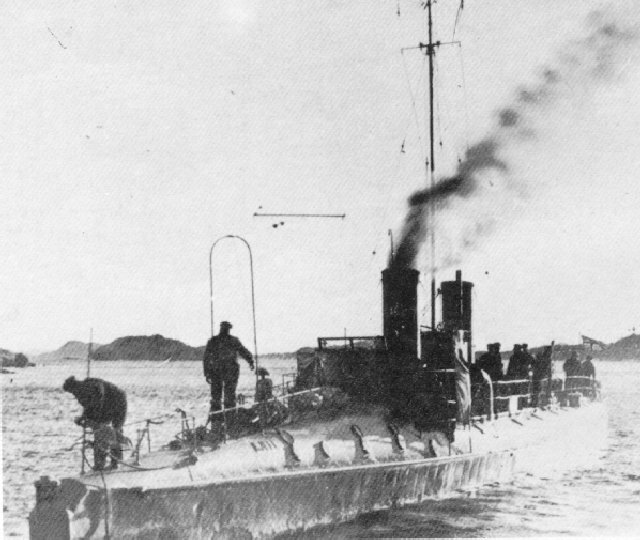 Some units were built during the war: Three torpedo class Trygg, completed in 1919-21; the Orkla gunboat (1917), the Fröya mine anchor (1916), and the two other Glommen class (1917). Coastal Battleship Norge (1900). 4 of such BS were in service, alongside two more of the older Haarfarge class. A powerful proposition for a coastguard. En 1905, the union between Norwegian and Swedish crown arrived to term, the former only possessing a rather small coastguard contingent of gunboats and TBs. Its limited industrial capabilities obliged the government to order its major units in UK, while Sweden was totally autonomous of foreign acquisitions. 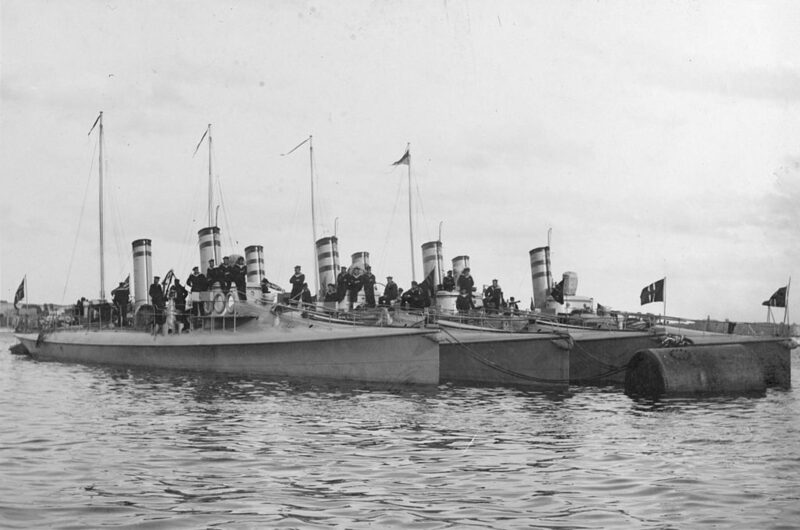 The Norwegian navy possessed a monitor, four coastal battleships, four gunboats, one destroyer and 12 Torpedo Boats in all, totalling 1000 active officers and sailors reinforced by 1000 conscripts. FY1914 Naval plan was more ambitious, aiming at a supplement of 3 destroyers, 3 TBs, 4 submersibles, and two more coastal battleships. Neutral for the duration of the war, Norway did not suffered of commerce disruption as much its freighter fleet was meager. Its most precious asset, iron, constituted the focal point of its neighbors. The Norwegian navy multiplied missions of minesweeping and coastal patrols. However, despite its well-known and well-shown neutrality, Norway leaned towards the allies. In 1916 indeed, she intercepted a precious German diplomatic suitcase, infected by germs destined to poison plasma bags en route for British casualties. HMS Glatton: Formerly Nidaros class, ordered to UK in 1913 but requisitioned after the outbreak of war. The British admiralty also tried in 1918 to drag more actively Norway into chasing U-boats, giving their precious latest acoustic equipment in exchange, but such proposal was rejected. 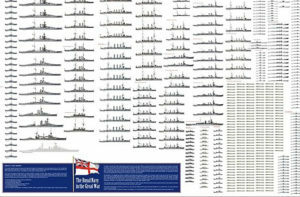 -4 Coastal Battleships: 2 classe Norge (1900), 2 classe Haarfarge (1897). Ordered (1913): 2 classe Nidaros. 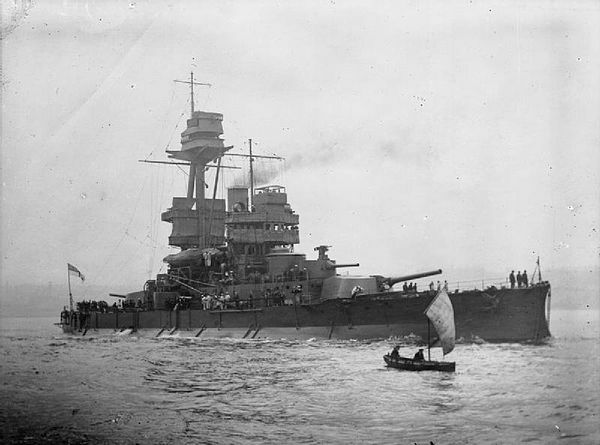 The latter has been ordered in UK was were requisitioned by the RN at the outbreak of war and integrated as the HMS Gorgon et Glatton. -2 Cruisers: Frithjof (1895), Viking (1891). These two small tonnage ships has been rebuilt and rearmed in 1904-1908. Frithjof served as schoolship. -4 Destroyers: 3 Draug (1908-13), single Valkyrjen (1896). 1st class: 3 Teist (1906), 10 Hval (1896-1901). 2nd class: 5 Ravn (1903), 4 Hvas (1900), 8 Varg (1894), 3 Snar (1888), 4 Od (1882). 3rd class: Rap (1872), Ulven (1878), Myg (1899). -4 Submersibles: Köbben (1909), three A2 class (1913), all built in Germany. 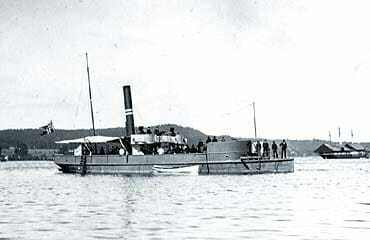 -11 Miscellaneous: Gunboat Aeger (1893), Ellida (1880), two Gor class (1884), five Vale class (1874), 2 Rjukan class (1860). 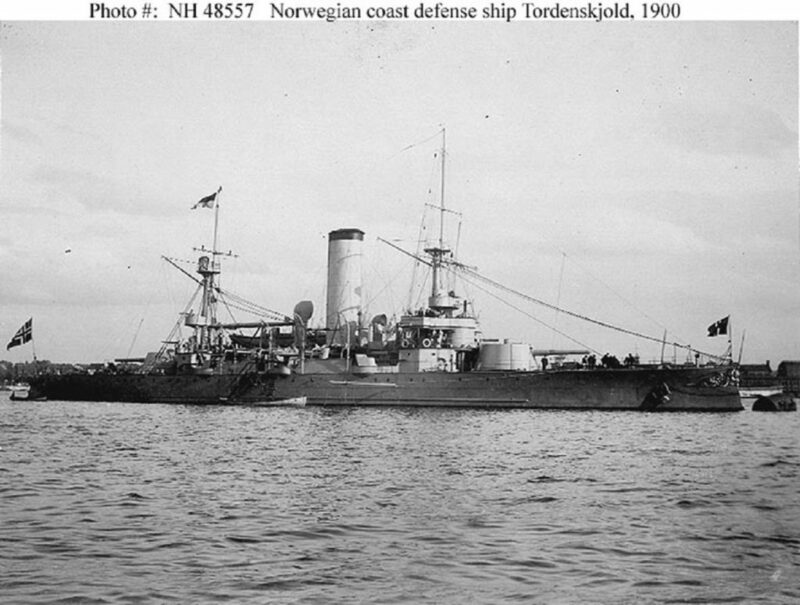 Until 1918, the Norwegian navy built Three Trygg class TBs, only achieved postwar, in 1919-21; gunboat Orkla (1917), minelayer Fröya (1916), and two Glommen class (1917). The end of Kalmar union between the Crowns of Norway and Sweden, was the result of count Bernadotte 1814’s active lobbying, recently ended in 1905. Sweden was left to control the Skattegat strait towards the Baltic, the eastern coast being controlled by the old rival from St Petersburg, the Russian Empire. Sweden however had the double chance to have a powerful industrial basis, and resources to go with these assets. 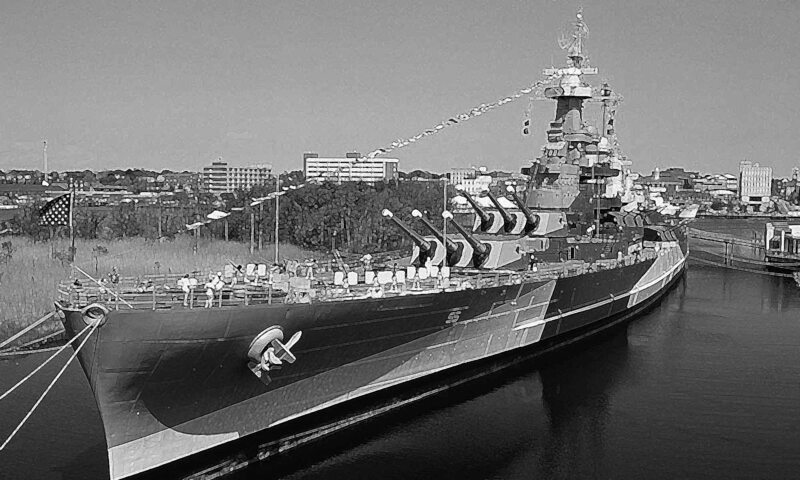 Its story was comparable to the US Navy, althought on the smaller scale. The diet (Parliament) approved many coastal battleships recently that dwarved any comparable ships and were worthy of “pocket dreadnoughts”. Already by far the most prominent Scandinavian naval power, Sweden was however still way below its European neighbours both in quantity and quality, making it only a regional naval power. Sweden innovated with submarines, noticeably those of Nordenfelt, produced by Bolinders Mekanika Verkstad and Nordenfelt, Karlsvik in Stockholm. In 1885 these submersibles made such an impression at an international naval exhibition that UK, Greece, Turkey and Russia bought some. They predated Holland and Laubeuf submarines by nearly 10 years. This tradition endured and Sweden aligned a rather powerful fleet of submarines in 1914. Naval bases were located at Karlskrona (the main naval fortress, fortified in the Vauban style), plus six large drydocks for submersibles at Stockholm, forts and coastal batteries, three drydocks, a TB base at Göteborg. Two other bases were located at Farösund, Gotland and Hemsö Bothnia gulf. The navy was commanded by an admiral, split between the coastal force and the fleet, divided into squadrons. Coastal defense wasn’t limited to forts but also comprised numerous batteries well hidden into granit-built blockhaus, rail batteries, and minelayers.